The Venetian courtesan has long captured the imagination as a female symbol of sexual license, elegance, beauty, and unruliness. What then to make of the cortigiana onesta—the honest courtesan who recast virtue as intellectual integrity and offered wit and refinement in return for patronage and a place in public life? 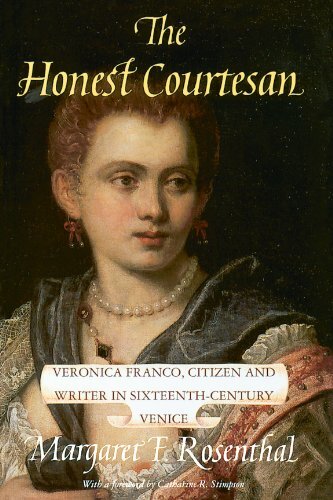 Veronica Franco (1546-1591) was such a woman, a writer and citizen of Venice, whose published poems and familiar letters offer rich testimony to the complexity of the honest courtesan's position. Margaret F. Rosenthal draws a compelling portrait of Veronica Franco in her cultural social, and economic world. Rosenthal reveals in Franco's writing a passionate support of defenseless women, strong convictions about inequality, and, in the eroticized language of her epistolary verses, the seductive political nature of all poetic contests. It is Veronica Franco's insight into the power conflicts between men and women—and her awareness of the threat she posed to her male contemporaries—that makes her literary works and her dealings with Venetian intellectuals so pertinent today. Combining the resources of biography, history, literary theory, and cultural criticism, this sophisticated interdisciplinary work presents an eloquent and often moving account of one woman's life as an act of self-creation and as a complex response to social forces and cultural conditions.